Setting out on an organizational transformation with DevOps can be overwhelming when you consider the scope and size of the changes it requires. Don’t expect the organization to change overnight, and don’t expect the entire organization to change at the same time. Unlike conventional frameworks, there is no blueprint or roadmap to getting started with DevOps. 1. What is the optimal or required business outcome? 2. How are current processes meeting requirements? 3. Why is this project or process a priority for change? 4. Who would benefit from a change in daily work? 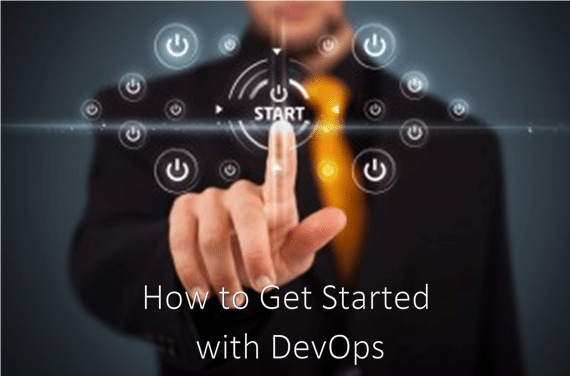 You want to pick the right app or the right line of business to start with DevOps. Rather than theorizing about DevOps, there’s no better way to get started than by picking a project and going into it with a DevOps mindset. Pick a critical application that has everyone’s attention as your starting point with DevOps. The temptation is to start small—but in DevOps, you will get the biggest payback from addressing a highly critical, highly visible app that is already causing problems. This will help ease a lot of the initial concerns about “doing things differently,” and success with DevOps will have a big impact on the organization. Observe and measure how things work today. How long does it take for a new requirement to get to production? Find the areas with the greatest pain and find the biggest bottlenecks. Get some data, create a baseline, and figure out how to update it. DevOps like any organizational initiative needs buy-in from the top and grass roots support. So, it’s imperative to get buy-in from the higher ups. For developers and operators to both be swayed into making changes, they need to see that this is an initiative supported by the organization as a whole. Make sure to form application teams that integrate every discipline–from Development, Testing, and Ops—together. As you start making changes, don’t forget to pay attention to the data. If the data gets better, then keep going. If things get worse, don’t hesitate to go back to the drawing board. Deliver, review, revise, and retrospect! Then, “Rinse and repeat”. You will need to improve education, communications, and cross-skilling. Create an educational roadmap to help to make sure that everyone is learning the skills they will need to be effective throughout the process. See our DevOps Training and Courseware page to learn more about the courses we provide.